First Line: There are two things you can't escape out here in the West: dust and death. 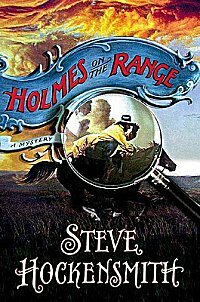 When brothers Old Red (Gustav) and Big Red (Otto) Amlingmeyer sign on as ranch hands at a spread known for being secretive, the only things they're expecting are lots of hard work, plenty of bad pay, and a bit of free time to enjoy reading their favorite stories about Sherlock Holmes. When a couple of men turn up dead, Old Red sees it as the perfect opportunity to employ his "deductifyin'" skills, and he sets out to solve the case. Although he doesn't like the looks of it one little bit, Big Red is along for the ride. If you read a lot of crime fiction, you know that there are some prime directives. One of them has to do with the disposition of the corpse. This book is so good that I forgot all about that basic rule. "Damn it, Brother," I said. "You're a cowboy, not a detective." Old Red didn't answer with words. He just turned and showed me that little wisp of a grin he slips under his mustache when he thinks he's being clever. Oh? his smile said. A feller can't be both? I thoroughly enjoyed this tale. Hockensmith has a unique voice and vision, and I can't wait to read the further deductifyin' adventures of Old Red and Big Red. I'm so happy to see that you loved this. I have it on my iPod and hope to get to it in January. Joy-- I hope you enjoy it as much as I did! I've got this but haven't read it yet. Just jumped up a bit in the TBR pile. Pepper-- Good! It's such an original premise and Hockensmith has a very visual style that I could see the whole thing unfolding on the movie screen of my mind.